Kate Hall sets two all-time Maine bests, and Denzel Tomaszewski runs the state's fastest 100 ever. NAPLES – It was a perfect day for fast times Monday at Lake Region High. With a helpful tailwind, Lake Region sophomore Kate Hall set Maine high school all-time bests in the 100- and 200-meter dashes, and Wells senior Denzel Tomaszewski broke the boys’ all-time best mark in the 100 at the Western Maine Conference track and field championships. Hall’s time of 11.68 seconds in the 100 preliminaries set the tone for her day, as it shattered the record of 12.12 by Freeport’s Logan Crane in 2005. Hall went on to win the final in 11.82. Then she was part of Lake Region’s winning 4×100 relay team — running into the wind on the second leg — that set a school record. Next, she established a new state best in the 200 — 24.96. Hall finished her day by winning the long jump with a distance of 18 feet, 4 inches. 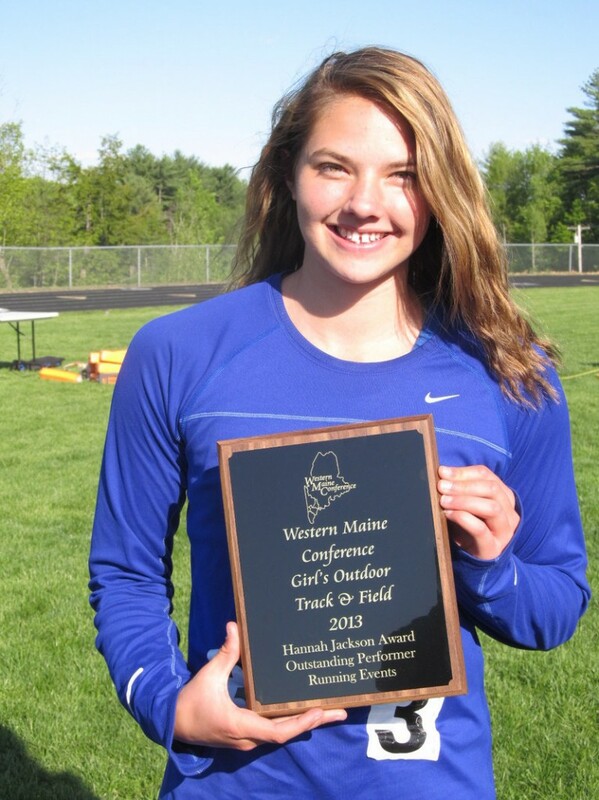 The only person to jump further in Maine girls’ track annals? That would be Hall, who went 18-5 earlier this season. In the 200, Hall started in the third lane and fully made up the stagger halfway through the turn. Entering the straightaway, the only race was against the clock. Hall’s time in the 100 ranks in the top 40 in the nation and is tied for seventh among sophomores, according to the website www.milesplit.us. “I have been looking online to see what the other girls have been running, but I didn’t expect to run that fast today in the 100, especially, so I’m really pumped about that,” Hall said. Hall and Lake Region Coach Mark Snow both noted that Hall had run below 12 seconds earlier this season. Because those were hand-timed marks, their veracity was suspect. 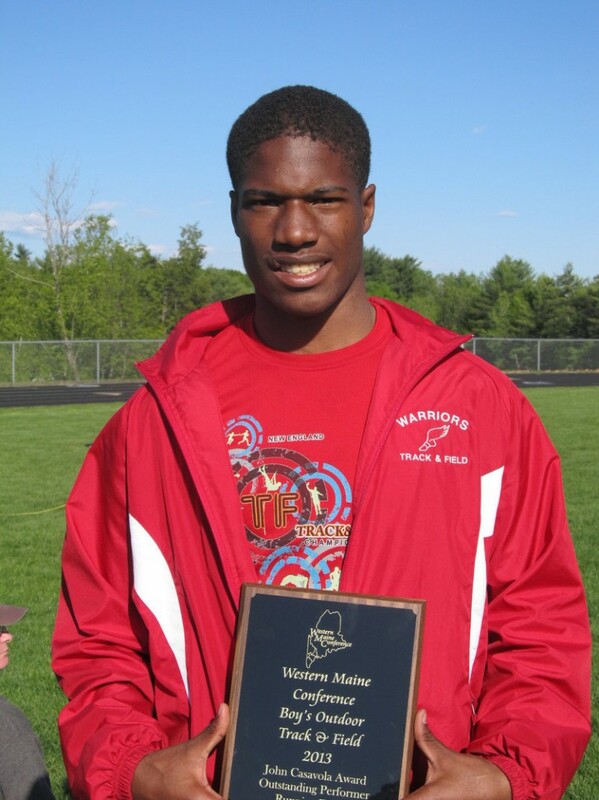 Hall will enter the Class B state championships Saturday as the reigning champ in the 100, 200 and long jump. Tomaszewski set his mark in the 100 final, running 10.76 seconds to snap the old mark of 10.86 set in 2006 by Edward Little’s Colby Brooks. Tomaszewski came back to win the 200 in 22.56 seconds, less than two-tenths off the meet record. Hall and Tomaszewski were named the outstanding female and male track athletes of the meet. In the team competition, the Greely girls’ won the Division I (large school) title, paced by a pair of double winners. Kirstin Sandreuter won the 1,600 and the 3,200, and Gwen Sawyer took the shot put (with an impressive 40-7 effort) and the discus, earning the most outstanding female field event award. York was second with 131 points, with Lake Region placing third. Traip Academy took the girls’ Division II championship with 156 points, with Freeport (111) in second. Sacopee Valley and Yarmouth tied with 76 points. Traip’s efforts were paced by Elora McCuddy, the overall winner in the 400 and the divisional winner in the 800; pole vaulter Kelsey Barnes, who set a meet record by clearing 10-2; and overall triple jump winner Jocelyn Lorrey. In the boys’ meets, Falmouth (140) edged Greely (133) and York (127) in Division I, while Wells (174) took the Division II title over Sacopee Valley (143) and North Yarmouth Academy (91). Traip’s Atencio Martin was named the outstanding male field athlete after winning the Division II high jump and posting the longest triple jump regardless of division at 44-1. Martin also won the Division II 110 hurdles.